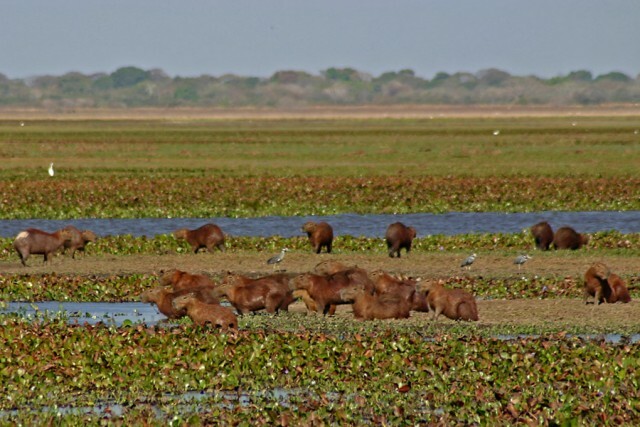 ALSO KNOWN AS the Orinoco River plains, the llanos of COLOMBIA and VENEZUELA are the northernmost section of the central lowlands of South America. The llanos are formed by a large geologic depression that once was an arm of the sea. This location is an alluvial basin between the northern ANDES MOUNTAINS and the Guyana Highlands. The region is generally very level, with a largely featureless landscape. Most of the llanos is tropical grassland, with some woodlands along the rivers. The Orinoco River borders the Venezuelan llanos to the south. Shallow depths, rapids, and waterfalls limit travel along the river. In the 1950s, Venezuela dredged the river, opening it to larger ships that could reach Ciudad Guayana. The Guaviare River, a tributary of the Orinoco, marks the southern border of the Colombian llanos. The lives of inhabitants of the llanos are regulated by rainfall that swell the region’s rivers and flood the plains. The rainy season is from April to November, with June through August generally the rainiest months. During this rainy season, the region’s grasslands turn green and grow quickly. During the dry season from November to March, rivers and lakes diminish, trees shed their leaves, and vegetation is covered with dust. Early in the dry season, stagnant pools remain, which traditionally have been breeding grounds for disease-carrying mosquitoes. Later, even these pools dry up completely, leaving a hard, sunbaked landscape. Grazing land is often scarce during the dry season and animals are sometimes short of water. This drought-flood cycle has traditionally limited farming in the llanos. There have been some attempts at flood control and irrigation, such as along the Guarico River in Venezuela. After the Spanish conquest of the coastal regions of South America in the 16th century, many Native Americans fled to the llanos. Soon, a llanero culture emerged that mixed native, Spanish, and African traditions. The economy came to depend on horses and cattle, as the Spaniards released these Old World animals into the wild. The animals roamed the plains with only limited supervision. Before the 19th century, there was no systematic animal husbandry. The semi-nomadic llaneros drove the animals to upland basins near the coastal and Andean cities for slaughter. Because the llanos were isolated, most of the meat was for local consumption. Hides were for both local consumption and export. Since the livestock was not part of international trade, there was little scientific breeding until the mid-20th century. The llanos played an important role during the Spanish colonies’ wars of independence in the early 19th century. Llaneros made excellent cavalrymen. They generally fought more for concrete material goals rather than abstract political ideals. At first, they fought for the Royalist side from 1813 to 1814. Later, many plainsmen joined with the llanero Patriot José Antonio Páez, who had joined with Simón Bolívar, the most important independence leader. The llanos continued to be a largely pastoral region after Colombia and Venezuela achieved independence. Low population and limited economic activity predominated until World War II. In the postwar period, oil and gas deposits near El Tigre, Venezuela in the eastern llanos changed the region’s economic focus. Also, Ciudad Guayana along the Orinoco River at the southern edge of the llanos grew into an important industrial center of more than 500,000 people. An example of growth pole industrialization popular in Latin America during the mid-20th century, Ciudad Guayana has become one of South America’s leading steel, aluminum, and heavy manufacturing centers.